The Skout harness worked perfectly for both our Olympus E-M1 cameras and was easily able to support the E-M1 II with the 12-100mm lens we use for everyday and travel photography, a total weight of 1,135 grams. We found it comfortable to wear, even in hot conditions and while engaged in fairly strenuous activities. It fulfilled our requirements for holding the camera in place while also keeping it readily accessible. 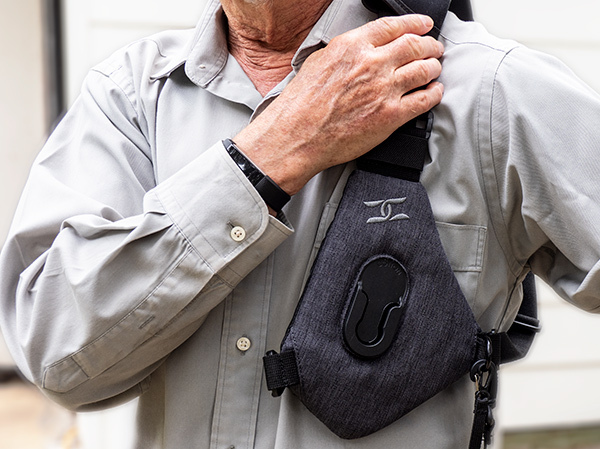 Cotton Carrier’s Skout camera harness is the result of a ‘hugely successful’ campaign that was over 1200% funded on Kickstarter. We’ve been looking for a product like this for many years, so we were an early subscriber. Having recently received our Skout, we’ve decided it’s well worth reviewing since there are few (if any) products filling this particular niche. 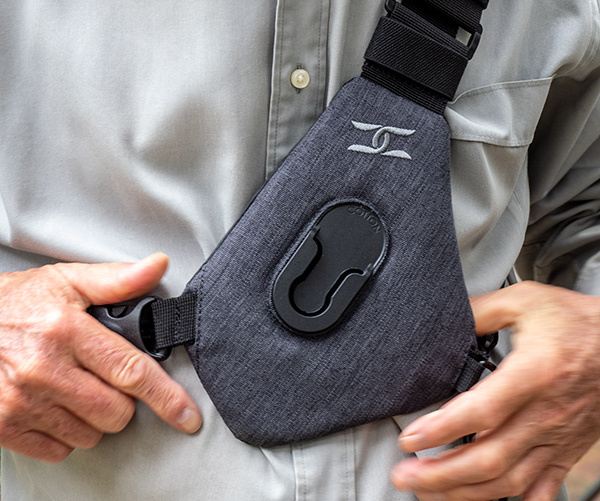 Designed by Vancouver-based company Cotton, the Skout lets you carry your camera (or a pair of binoculars) securely close to your body in the centre of your chest while making it easy to detach for use. 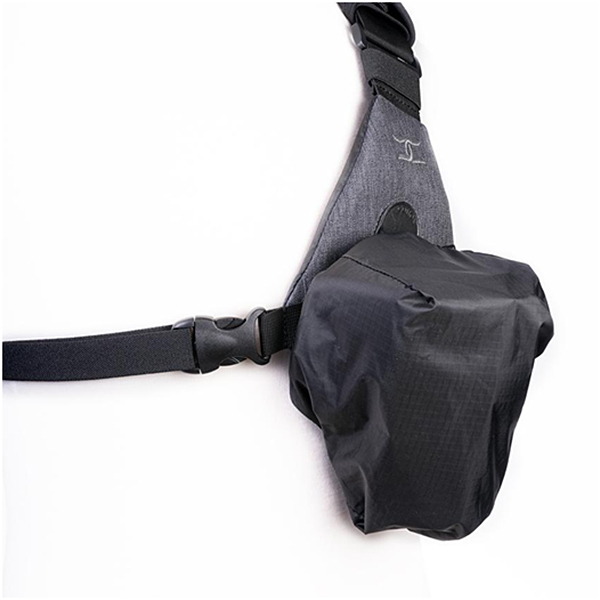 The Skout is an adjustable, one-size-fits-all harness made from Kodra Synthetic canvas with a rigid, front-facing camera-mounting plate that has a specially-designed twist lock. Supplied with the harness is a circular, hard-anodised aluminium hub that is fitted to the camera via a bolt that screws into the camera’s tripod socket. A soft washer fits between the hub and the camera body to keep it in place and prevent possible damage to the camera from the metal hub. The two-piece assembly is attached with an Allen key (supplied). Both the hub and the washer have slotted holes to permit the slight adjustment that may be required on some cameras to avoid blocking the battery door. 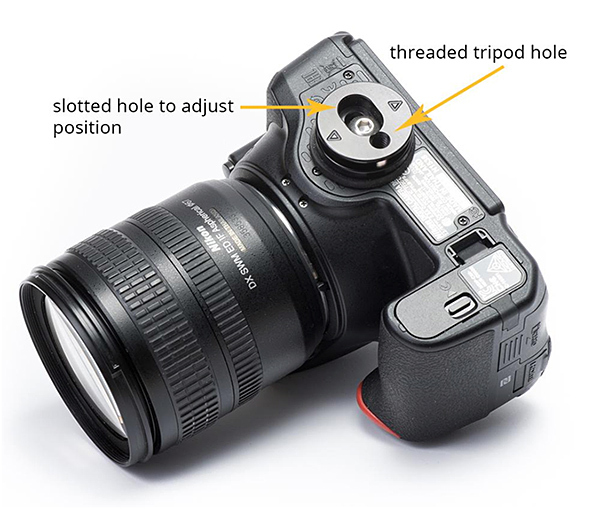 A threaded hole on the hub provides an additional socket for attaching the camera to a tripod. The Skout harness slips over the wearer’s left shoulder. 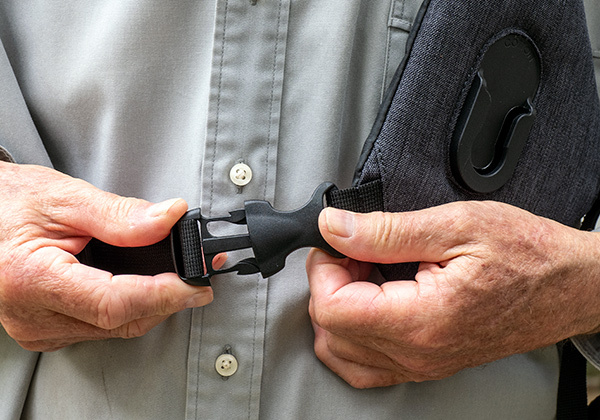 The harness is easy to put on and remove; it simply slips over your left shoulder and has a strap that passes around your torso to secure it in place. You then position the strap padding on your shoulder and the camera carrier on your chest before passing the chest strap around your torso and tightening it, then adjusting the straps at other two points to keep it in place. The three-pronged clip is large enough to be easy to open and close yet provides a secure attachment. 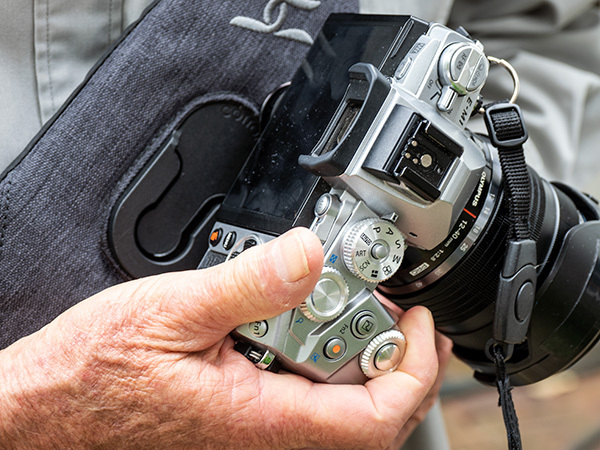 The three-pronged clip that links the end of the chest strap to the camera carrier. Positioning the harness on the wearer’s chest. An additional, thinner tether strap is provided for securing the camera in case it is accidentally dropped. 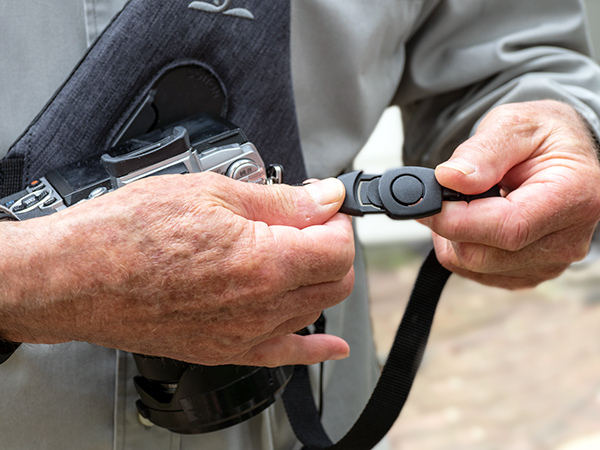 The end of the camera tether strap is attached to the strap eyelet on the camera body, using the ring tab if you want to leave the neck strap in place or if the camera has no eyelet. The tether strap is attached to the Skout by clipping it onto the D-ring. Attaching the clip of the tether strap to the camera. To fit the camera into the Skout, rotate it through 90 degrees and slide the hub into the slot, as shown below. Rotate it so the lens points down. To detach the camera for taking shots, simply reverse the twist motion and the hub will come free from the lock. Fitting the camera into the twist lock. The camera in position on the wearer’s chest. You can see the G3 Weather Cover bag hanging next to the tether strap. The Skout comes with the G3 Weather Cover, a self-containing bag that can be fitted over the camera and lens to protect them against dust and rain or spray. It is secured with a bungee closure and clips onto the same D-ring as the tether strap. There’s approximately 25 cm of clearance inside this cover, enabling it to accommodate a typical DSLR camera with telephoto zoom lens. The weather proof bag has a Velcro closure and a clip to attach it to the Skout. Skout harnesses are available in two colours, Realtree Xtra Camo and Charcoal Grey. A zippered pocket on the inner surface of each Skout provides space for storing the Allen key and small items like a phone, cash or cards of various types. Skout harnesses are supplied with a mesh carrying bag and carry a three-year warranty. 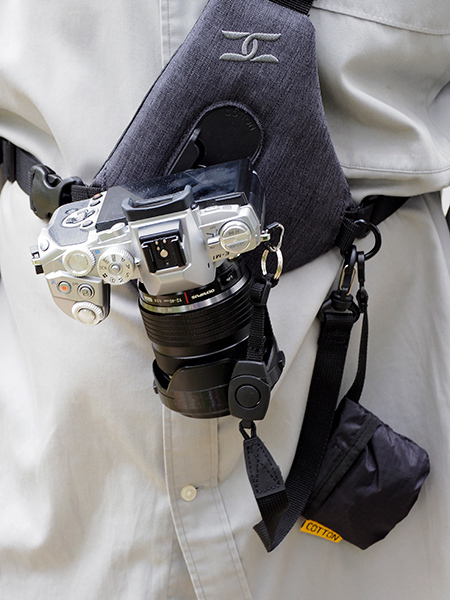 The main benefit of using a camera harness rather than a camera strap is that it holds your camera close to your body. This lets you walk, ride, run or even climb without the camera flopping around and banging against you and anything in your close proximity. Skout harnesses will suit active travellers, bushwalkers and even street photographers. Simple to use and relatively inconspicuous to wear, they could also work well for photojournalists who can work with a single camera and lens. 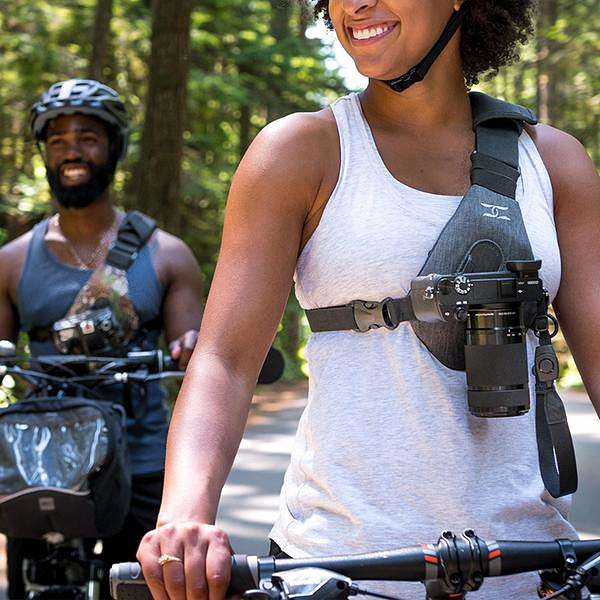 The harness and accessories won’t take up much space in your camera bag. Aside from active photographers, just about anyone who likes to keep their camera close at hand but doesn’t want it to get in the way could find them appealing. However, they won’t suit photographers who like to carry a couple of cameras and two or more lenses. Features: Adjustable straps with quick-release buckles, inner compartment for keys, cards or cash.